In this article, I'm going to introduce you to an amazing free tool that you can use to create digital illustrations. 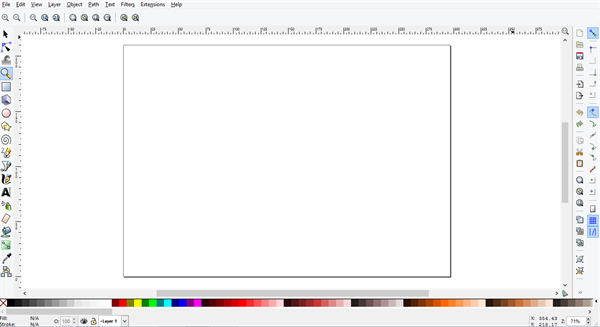 Inkscape is an open-source and free alternative to Adobe Illustrator. Read on to know about the features as well as the pros and cons of Inkscape. Inkscape is a vector graphics editor. The best part about this amazing software is that it is open-source meaning that you can download and use it for free and you won't have to deal with any copyright issues. Inkscape is kind of a free alternative to powerful vector software like Adobe Illustrator which is paid software. The software is written in C++ and does pretty much all the work needed for a digital illustrator. It is available for Windows, OS X and Linux and is really small in size: 93.3 MB at the time of writing this article. It is available in 66 languages. So, let's get right into what are the basic features of Inkscape. The following are the features of Inkscape. With the following features and tools, you can create or edit vector graphics like illustrations, diagrams, line arts, charts, logos and many more complex drawings. Different tools including Pencil tool, Pen tool, and Calligraphy tool are available in Inkscape which make drawing any kind of design possible. If you want to draw simple paths and freehand drawings you can use the Pencil tool. Pen tool can be used to create Bezier curves and such type of designs. Calligraphy tool can be used to create designs with calligraphic strokes on it. At any time during the design, you can change the shape of the object by editing the nodes. Moving nodes, Bezier handles, node alignment and distribution are present for this. Text can also be added to the object you create using the Text tool. Multi-line text can also be created using the Text tool. Shape Tools can be used to create specific common shapes like rectangles, ellipse, polygons, and spirals. Drawing these basic shapes with the Pen and Pencil tools can be time-consuming and difficult. You can use the shape tools to speed up your work. You can also use embedded bitmap with command to create and embed bitmaps of selected objects. You can move, scale, rotate and skew the objects you create using the transformation options. You can do this by dragging on the selected parts of the object interactively or if you want to be precise you can directly enter some numerical values and the object will be transformed accordingly. You can also align and distribute elements in the canvas for precise designing using the Alignment and Distribution commands. Layers are also available in Inkscape which gives you more flexibility to work with complex shapes and designs. You can create different layers and split up your design into different layers with similar content going to similar layers. After that, you can rearrange the layers, lock them, hide them and perform such operations on them. Z-order operations are also possible in Inkscape. It means that you can raise one object on top of another working like in 3 dimensions. This can also be useful in many situations. You can also group elements as a separate group so that when you do any changes to that group like apply transformations then all the elements in the group will get affected by them. Text is supported in Inkscape using the Text tool. You can create multi-line text. All the fonts in your system can be used in the texts. You can also type text on a path you create. This can be really useful in designing logos where you need to sometimes write text to be matched perfectly with a different shape. The paths can be edited any time. Text in shape is also possible in Inkscape. A color selector is available with RGB, HSL, CMYK, color wheel and CMS. There is also a color picker tool which you can use to select color from anywhere on the screen and the correct value of the color is loaded in the color selector. You can copy and paste the style of one object to the other object. A gradient editor is also present in Inkscape which also is capable of multi-stop gradients where you can set different colors and set the range of each of the intervals of the colors and create the exact color pattern that you want. Pattern fills are also present where you can also select patterns from bitmap or vectors. Different types of strokes are available like dashed and many predefined dash patterns. You can select the one you need and start drawing. You can export your design as different file formats. Perfectly compliant SVG format file can be generated. Other file formats include PNG (which supports transparency), OpenDocument Drawing, DXF, sk1, PDF, EPS and PostScript export formats and more. Command line options are also available for export in a more customized and automatic way. It is open-source. So you can use it for free even for commercial purpose. You can also add your own features to it if you are a programmer because the code is available publicly. It is small in size and you can run it on pretty much any system you have. It doesn't take too much of the processing power. It has collapsible side palettes which are a great feature if you need more space for your creativity. The interface follows the usual design pattern and thus can be understood fairly easily. You can apply as many filters as you want. There is a wide range of unlimited filters in Inkscape. Inkscape seems to get slower and laggy if you apply too many filters on your object. Inkscape is a great tool for digital artists because it provides you with all the necessary tools to create your own vector design. The great thing about vectors is that they are stored as mathematical equations and thus you can enlarge them as large as you want but still have the highest quality of the image. This is the reason why vectors are so important in design. The best thing about Inkscape is that you can download and use it for free because it is open-source. It doesn't have all the features of the paid professional tool like Adobe Illustrator. But it is the best to get started with if you are a beginner. Moreover, you can contribute to the Inkscape society by adding your own features and patches to the software if you are an advanced programmer. So, if you are looking for free vector graphics editor then Inkscape is probably the best one that you have. It is a popular vector graphics editor as well. Refer the reader to visit official website and download it.